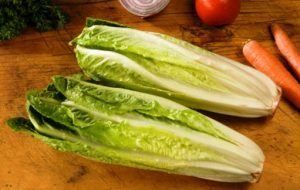 Home » Power Foods » Why Romaine Lettuce is the Best! Why Romaine Lettuce is the Best! The most nourishing lettuce is Romaine lettuce because it is one of the superfoods full of health benefits! An ordinary salad becomes very tasty with crispy and refreshing Romaine lettuce. 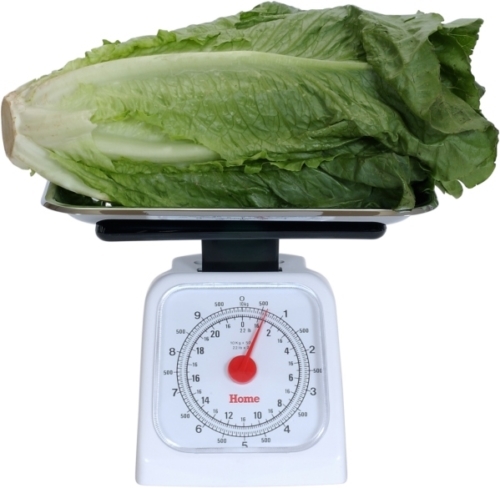 Each American consumed almost 11 pounds of Romaine lettuce in 2014 and 14 pounds of other lettuce. Obviously, they did not know that Romaine lettuce is the best! It certainly is my favourite lettuce. It is easily overlooked as being a food worth eating but it is full of health benefits which you will see below. Romaine lettuce has 48 micrograms of vitamin K per cup which is 60% of the daily requirement (iceberg lettuce only has 17 mcg). Low intake of vitamin K may increase the risk of hip fracture in women. Romaine lettuce is low in carbs and has 0 grams of sugar and fat. It is high in nutrients and 1 cup has only 8 calories, so you can eat all the lettuce you enjoy when wanting to lose weight. Also, Romaine lettuce is high in fiber (5 grams per cup) and full of water making it filling. Chlorophyll, found in dark leafy greens, such as Romaine lettuce, has been found in studies to lower the risk of some cancer. Romaine lettuce is a good source of potassium which studies have shown to help lower high blood pressure. Lettuce is a highly alkaline forming food. An overly acidic condition weakens the body and can become dangerous. Our body requires a slightly alkaline condition to function well. Learn more about the Benefits of a Properly Alkalized Body. Romaine lettuce has good fiber, especially when you eat a big salad full of it. Fiber binds to bile salts then removes them from the body, forcing the body to make more bile. When it does this it breaks down cholesterol to do so. When there are low blood levels of folate people are more likely to suffer from depression, and it was found that they may not respond as well to treatment with antidepressants. Folate (folic acid), the type found in romaine lettuce can reduce birth defects of the spinal cord and brain by more than 70 percent. It works best for the mother and baby during the first month of pregnancy. It is an excellent source of vitamin A, vitamin K, vitamin C, and folate. Also, romaine lettuce is a good source of fiber, manganese, potassium, biotin and much more. Here is the full Nutrient Data for Romaine Lettuce. Did you know that Romaine lettuce is the oldest cultivated lettuce in the world? It was first grown around 3000 BC which is when a picture was created on an ancient Egyptian relief. It seems it was an important part of Egyptians meals. NOW Romaine lettuce is being grown in an International space station! “There is evidence that supports fresh foods, such as tomatoes, blueberries and lettuce are a good source of antioxidants. Having fresh food like these available in space could have a positive impact on people’s moods and also could provide some protection against radiation in space,” said Dr. Ray Wheeler, lead for Advanced Life Support activities. Iceberg lettuce got its name at the beginning of the 20th century in California when there were not any refrigerators to transport it. To prevent spoilage, large amounts of ice were used in the trains on their trips to the market. Lettuce oozes small amounts of a milky white liquid when their leaves are broken. Its scientific name is Lactuca sativa and Lactuca is derived from the Latin word for milk. Lettuce was first called rabbit food in the 1930s. Ancient Greeks and Romans believed that lettuce induced sleeping so the Greeks served it at the end of the meal. Lettuce is a member of the sunflower family. Enjoy crispy green Romaine lettuce in delicious ways and benefit from its surprising health benefits. 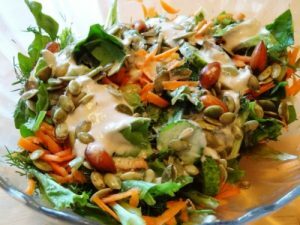 See my variety of recipes below from a simple salad to a lettuce sandwich to fresh vegetable juice. First, learn how to choose, store and prep romaine lettuce. Choose bright crisp looking romaine heads of lettuce that are not wilted or do not have brown or yellow leaves and no dark or slimy spots. The Romaine lettuce should have dense heads with a green stem end, not a brown one. Best to buy organic romaine lettuce; it is one of the top 20 fruits and vegetables that have the most pesticides according to research by the Environmental Working Group (EWG). Like all soft green leafy vegetables, it is vulnerable and easily absorbs the pesticides because it does not have a thick protective skin like avocados do which have the least amount of pesticides according to EWG. Lettuce is highly perishable; Romaine lettuce is the least perishable. Romaine lettuce will store longer if you tear the leaves away from the stem, wash and dry them well, then, store them in a plastic bag lined with paper towels or cloth to absorb any excess moisture as this will cause the lettuce to decompose quicker. You can also use green fabric bags. Store it in the fridge crisper. I find it will last for up to a week this way. If you store wet lettuce in a produce bag, it will likely only last a couple of days. Be sure to store it away from ethylene-producing fruits (apples, bananas, and pears) as they will cause the lettuce leaves to brown. First, remove the outer leaves and cut off the bottom white tip of the lettuce as it can be bitter. Rinse in clean water, then pat dry or use a salad spinner to remove the excess water. It is best not to chop the lettuce, better to tear it because cutting releases the chemicals that oxidize and lead to browning of the lettuce. Learn more about some of the healthiest vegetarian foods you will always want to have in your pantry or growing on your deck. READ: Superfoods – Over 100 of the Healthiest Foods You Should Have in Your Diet and learn more about the variety of Superfoods we think you should have in your diet.